Why go to the coffee shop all the time and pay for expensive coffees when you can make them cheaper and more conveniently at home? With the help of a coffee bar, you should be able to get your daily cup of coffee at a fraction of the cost and often much quicker. The best part is that you can customize your home brewing station to perfect the art of making coffee and make your own caffeinated beverages exactly to your liking. Those with a penchant for specialty drinks should definitely consider investing in a coffee bar. You just need to dedicate a special area where you will craft some delectable coffee drinks to make your mornings better. 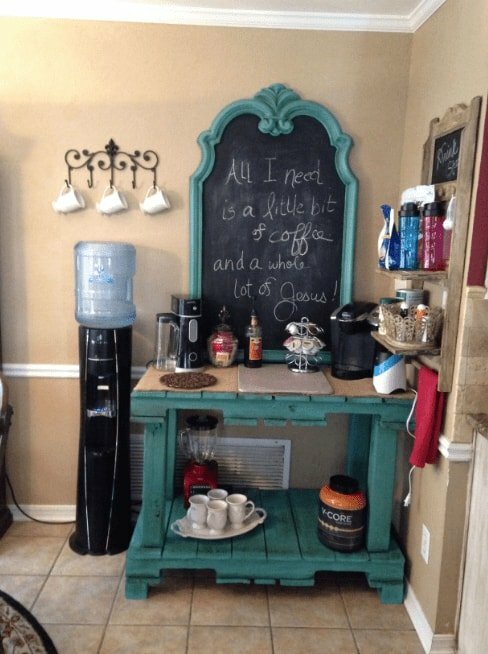 There are no strict rules when it comes to designing a coffee station at home and that could be both a blessing and a problem. 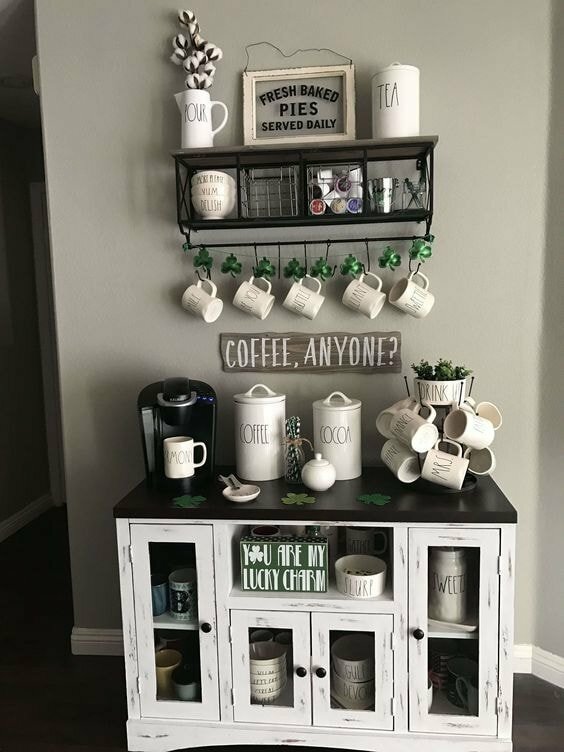 You have the freedom to create a personalized coffee bar but you might feel reluctant as you don’t know where to start. This is where this article comes in as it will show you some inspirational ideas that often involve a bit of DIY work. Whether you plan on creating a coffee bar in the kitchen or somewhere else in your home, these ideas should be helpful to figure out the right kind of look and atmosphere you’d like for your own brewing station. A coffee bar is also an excellent choice for entertaining guests, similar to home bars. 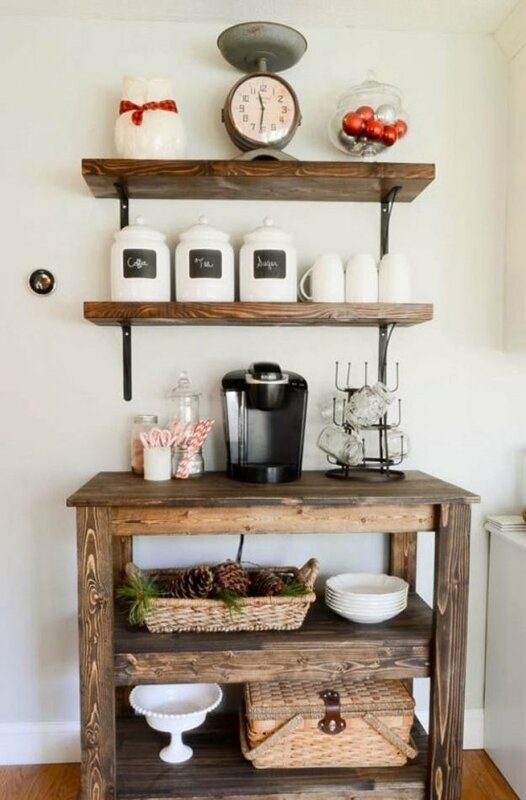 With the help of reclaimed wood, you can easily craft a coffee bar with a more rustic theme. 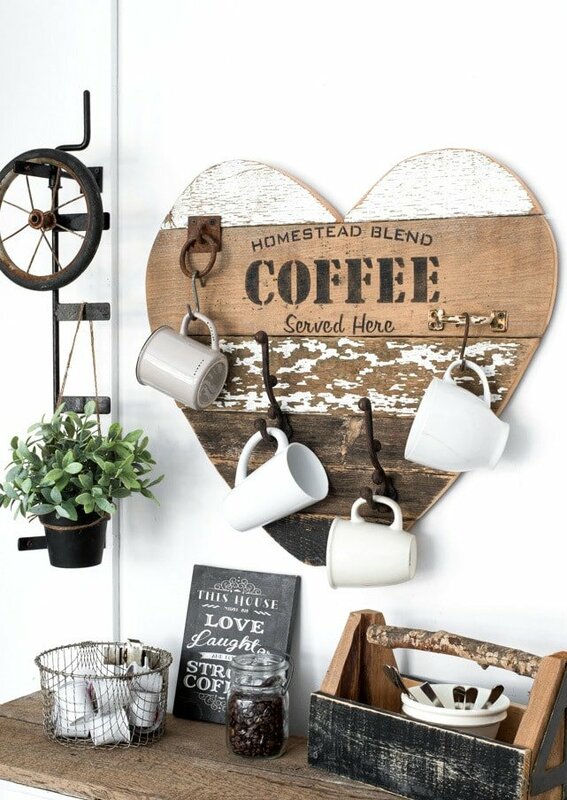 This brewing station makes use of a beautiful mug hanger in the shape of a heart. Other decorations contribute to the theme and make preparing coffee a fun experience. If you’re interested in the details of this DIY project, you can check it out here. 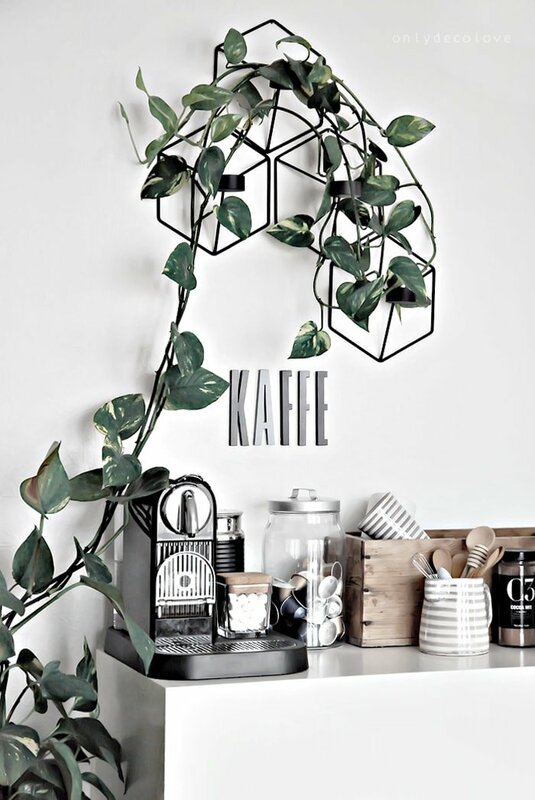 Fans of Scandinavian décor will probably love this elegant coffee corner that comes with a very streamlined look. It gives off some minimalist vibes while maintaining things fresh with the help of greenery. This coffee bar is primarily designed with functionality in mind. There are lots of storage options and it looks like all the necessary items involved in the process of coffee brewing are ready to be used every day. 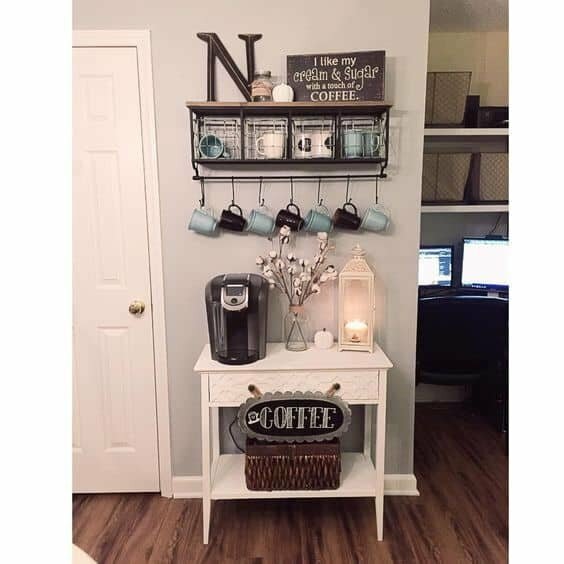 Considering the ideal balance between coziness and style, this coffee station could be a fitting choice for many homes, particularly for those who wish to add a little hygge flair to the décor. 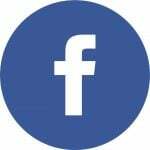 If you’re curious about more details regarding this project, this link could be helpful. 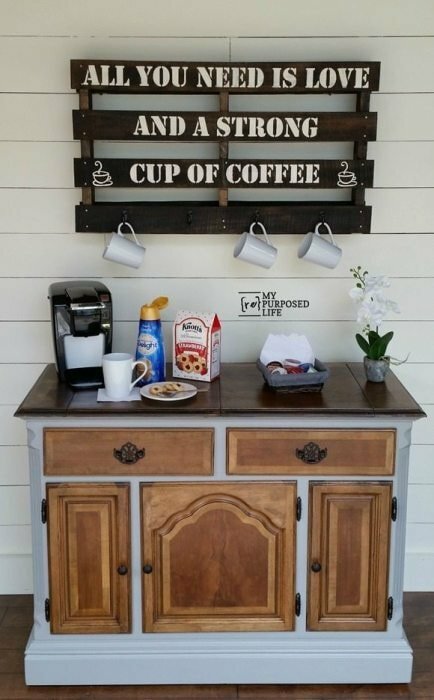 In case you’d like to have a coffee bar and would rather not purchase another piece of furniture, you can try repurposing existing items. The old cabinet from this DIY project represents a solid example as it’s been transformed in a central piece for the brewing station. The buffet isn’t very large but it has plenty of storage options and a decent surface area where you can prepare the coffee. For a personalized touch, you could add a rustic DIY sign. There’s quite a bit of work involved when it comes to repurposing furniture, but results like this are proof that it’s worth the effort. 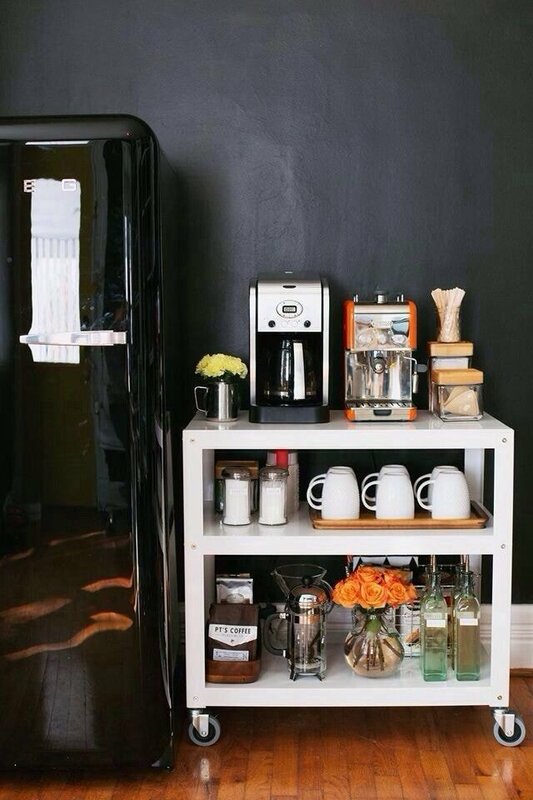 Having enough storage space is essential when building a coffee bar. 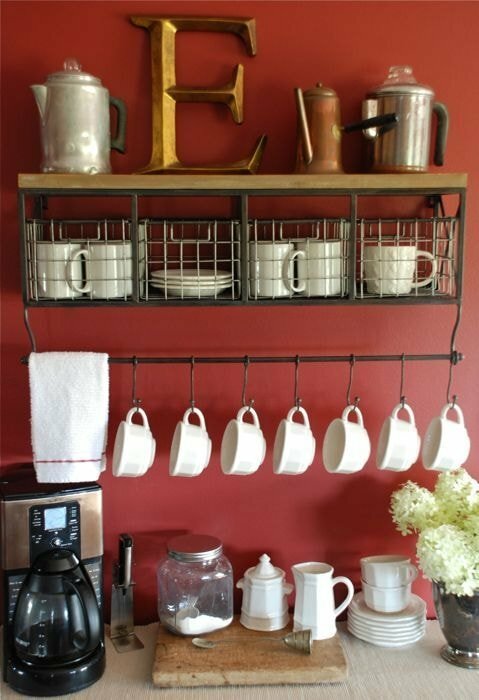 If you have lots of mugs and accessories, you will need to find a way to maximize used space. 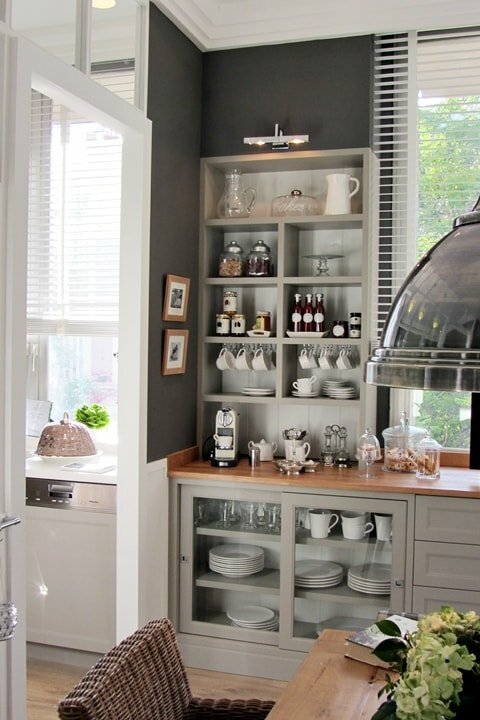 One of the most efficient storage methods is to add a tall shelving unit like this elegant gray model. The unit is built-in and allows you to organize all the provisions and create an attractive coffee station. To make your coffee bar stand out from the ordinary, you could try a more specific theme, such as the industrial one. You don’t need lots of items for this design as just a few metal elements should do the trick. Get some wire baskets that can be mounted on the wall. This model from Amazon is a good example. 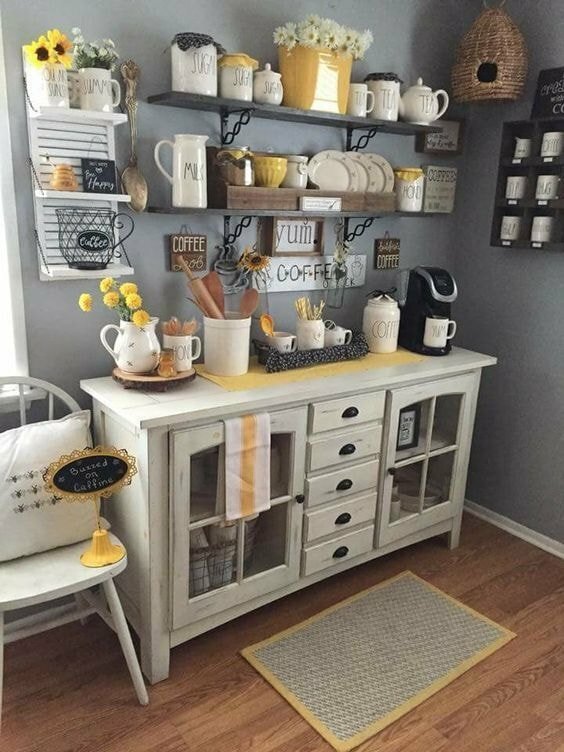 Then you just need to add a hanging bar where you can place more mugs and accessories. 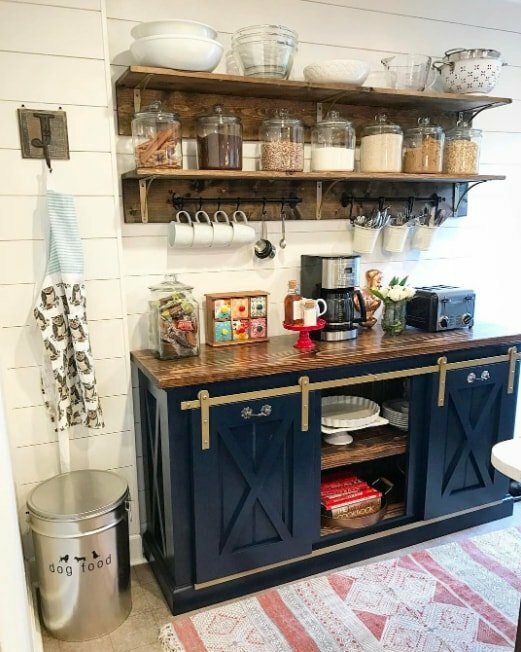 If you would like a coffee bar with a more traditional look, check out this brewing station designed in a farmhouse style. The materials used, such as dark wood, bring out the natural qualities of the bar and give it a strong rustic flair. We like the addition of floating shelves for some extra storage space. Take a look at this set of floating shelves from Amazon if you’re interested in a similar aesthetic. The white wall forms a lovely backdrop for this farmhouse style coffee bar. As opposed to more rustic coffee bar styles, this elegant brewing station takes inspiration from French bakeries for a very charming look. White elements dominate here while the blackboard provides some excellent contrast. All kinds of small details contribute to a quaint impression. Some of the highlights include hanging baskets, the ornate buffet table, and various decorations that complete the Parisian appeal of this coffee bar. 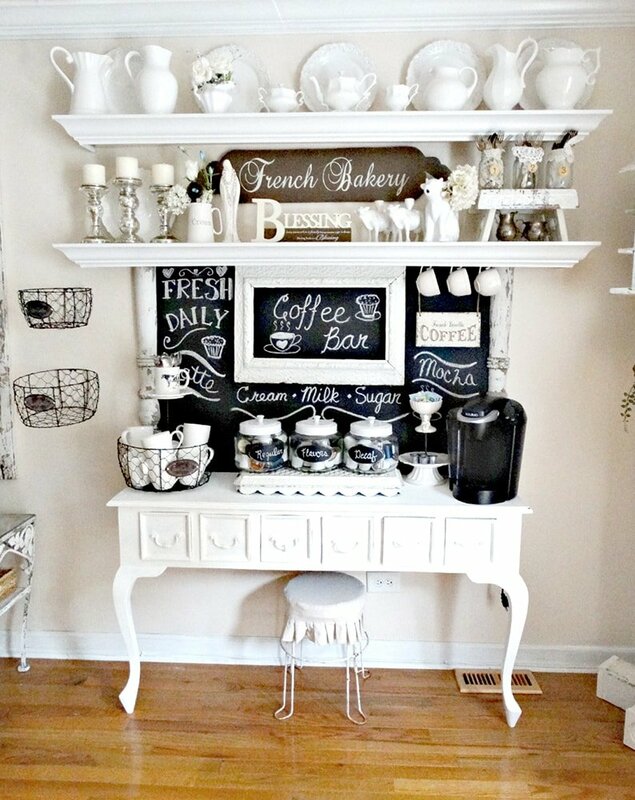 Not everyone has the possibility to dedicate a lot of space to create a coffee bar. Sometimes you need to learn how to work with a more limited area. If you can’t find a good use for that awkward corner in your home, it’s not that hard to transform it into a brewing station for your favorite coffee drinks. This represents a smart storage solution for the provisions of the coffee bar while maximizing the available space. To maintain a harmonious look, consider retaining a uniform color scheme. We like how the off-white cabinet here blends so nicely with the wall and there’s also a visually pleasing effect coming from the matching countertop and wood floating shelves. For those who don’t have square footage limitations, consider adding enough serving space. Go for a larger kitchen counter and bring in some seating options to make your coffee bar more functional. 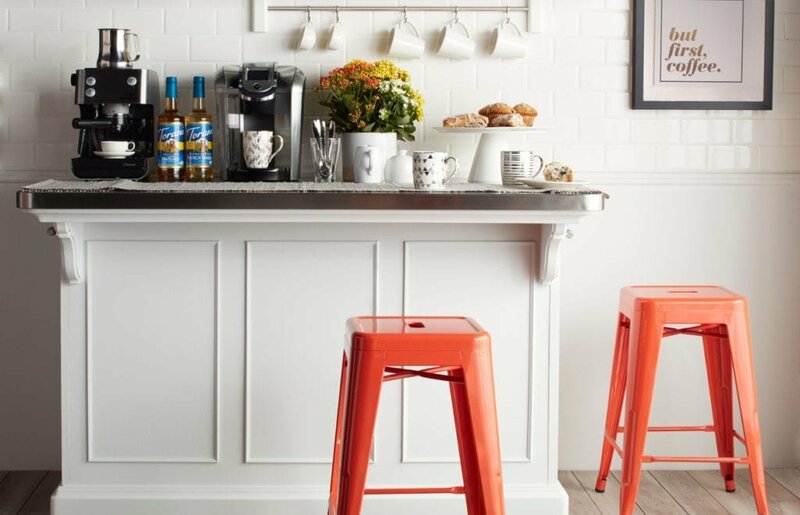 Don’t forget about keeping things stylish with the help of a pop color like it’s done here with coral hues on these bar stools. If you’re searching for a good way to add more style to a coffee bar, there are lots of options to try. 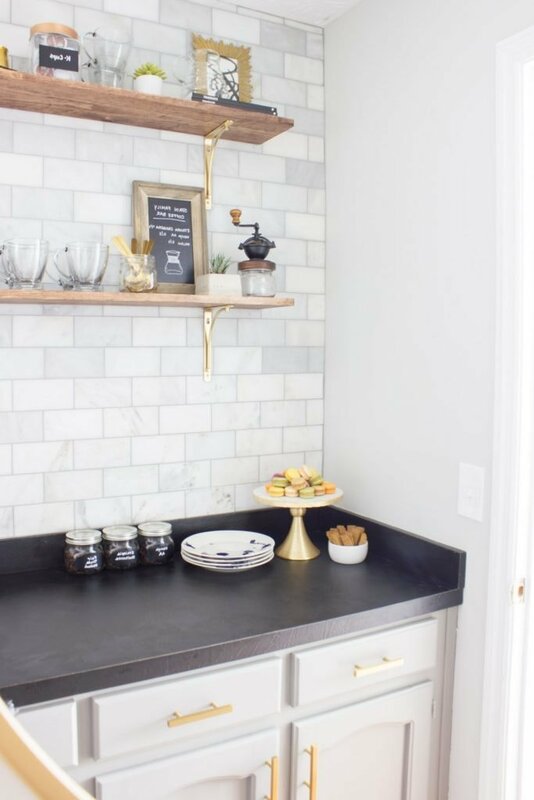 One of our favorites is incorporating more gold elements like it has been done in this beautiful coffee bar makeover. An outdated wet bar has become much more appealing thanks to the sophisticated gold accents like the spray-painted shelves brackets and the handles of the cabinet. This is one of the easiest ideas you can try given how it doesn’t require much space. Purchasing a mobile cart is a convenient way to craft a coffee bar. You can find some inexpensive models, such as this bar cart from Amazon, that provide enough storage for all your coffee preparation needs. The good news about a rolling coffee bar is that you can always move it around for more convenient placement. It could be a great solution for delighting your guests with your specialty coffee drinks right away instead of working in the kitchen and then serving them. 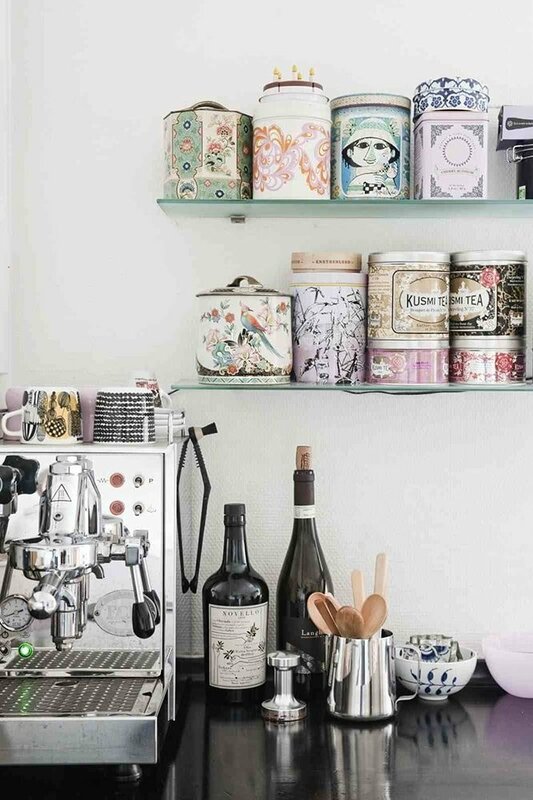 Many people enjoy the idea of giving their coffee bar a specific theme. 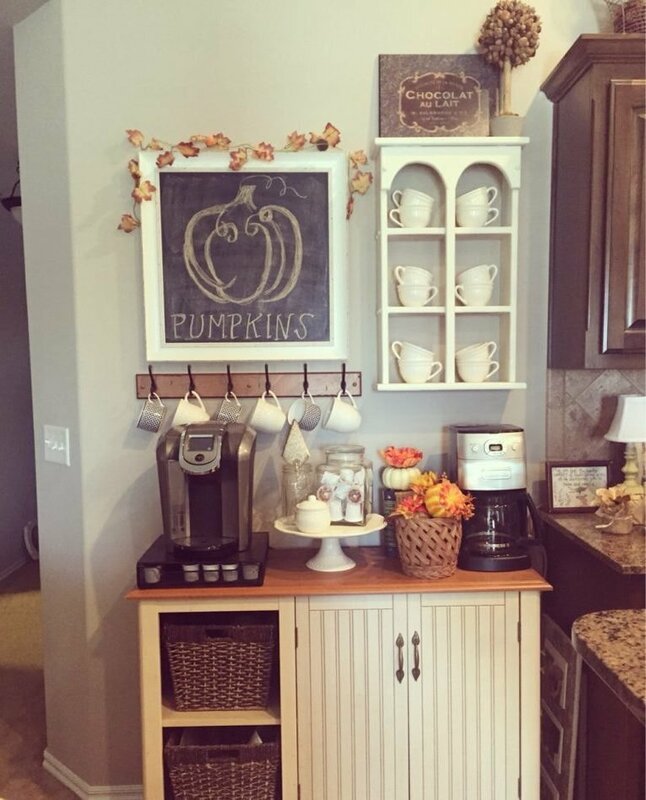 If you like the fall season, why not give your brewing station an autumn theme? This can be achieved using various motifs such as pumpkins and dry leaves for your decorations. The resulting effect is sure to put everyone in a seasonal mood. Barn doors have all kinds of décor uses thanks to their farmhouse vibe. A coffee bar will be able to stand out from the rest if you choose sliding barn doors for the main storage unit instead of regular cabinet doors. In case you feel that barn doors have a very strong rustic effect, you can tone it down by painting the doors in a more modern color such as navy blue. There are many ways to incorporate turquoise into your home décor and designing a coffee bar with this vibrant shade is one of them. While this beige kitchen corner provides a fairly rustic impression initially, the added turquoise on the main elements of the bar adds some fresh vibes to the area. One of the highlights of this look is the ornate chalkboard with its teal frame. If you need to work from home very often, it can quickly get tiring having to go to the kitchen to obtain your coffee fix. The best solution is to position a simple coffee bar close to the home office making it more convenient to reach for your coffee supplies. 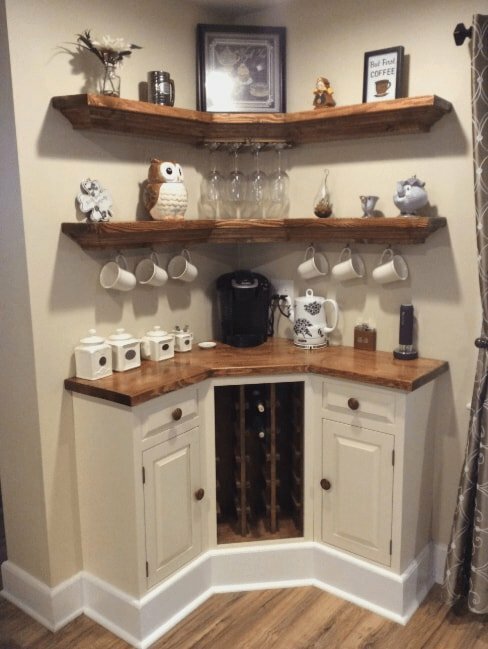 There’s not a lot of space required to design this kind of coffee bar as you can mount a storage unit on the wall for the cups and a simple table for your coffee maker. If you’re more concerned about the aesthetics of your coffee bar rather than the functionality, you just need some inspiration to add a more personal touch. This brewing station represents a creative example given the whimsical effect of the colorful tins that are both useful and fulfill a decorative role. Those with a large collection of coffee types and flavors should consider purchasing some colorful and interesting containers that can be displayed on shelves in the coffee bar. 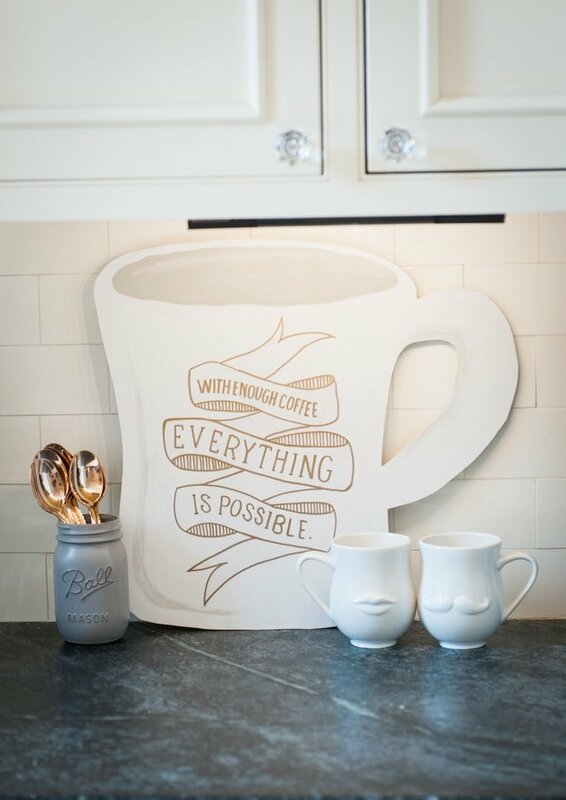 Adding a sign to your coffee bar makes the area look nicer and better organized. If you have the time and artistic talent to tackle a DIY project, consider painting a coffee sign by hand to give your brewing station a unique look. Alternatively, you can purchase a pre-built sign. Here’s a great model from Amazon. We like the retro design and usefulness given the coffee menu. 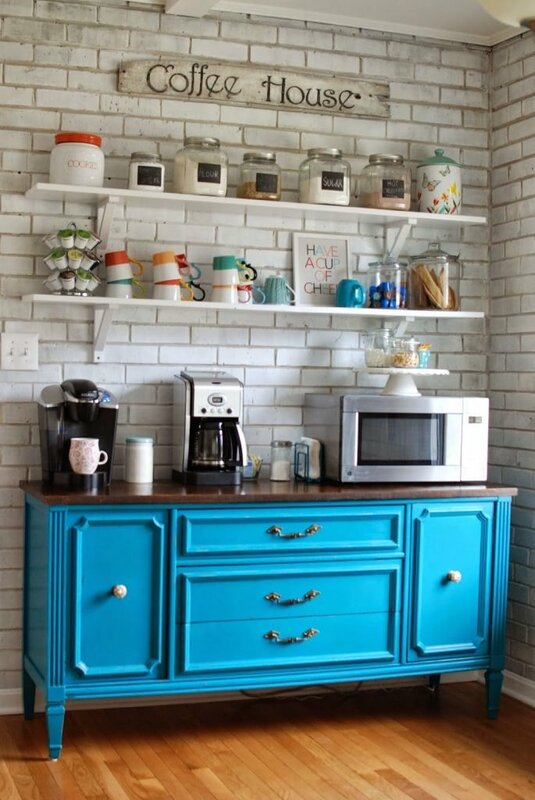 For those who feel adventurous and want to try out a vibrant design, check out the beautiful contrast obtained from the bright blue cabinet against the white brick wall. There are lots of interesting examples of powerful contrast, but this one is one of the most eye-catching we’ve seen. While the overall décor is fairly simple, this coffee bar is sure to capture the attention of all your guests. 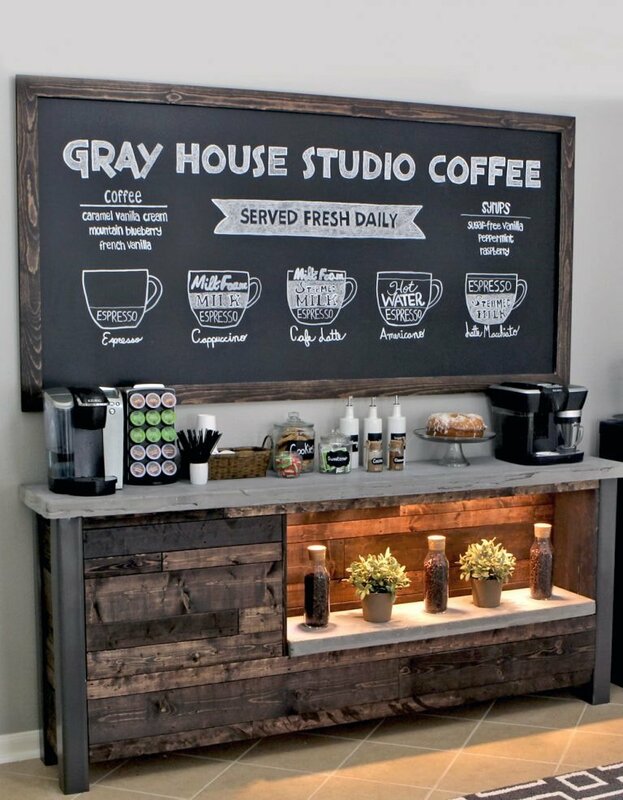 While getting a coffee bar sign could be a neat addition for your home brewing station, you can take it a step further and implement a large chalkboard where you can design your own coffee menu. This is a more practical solution if you like the idea of regularly changing what’s written. You can show off some interesting coffee drinks recipes or just add your favorite funny quotes. The design of this coffee bar has a very uniform quality to it. This is mostly due to the pleasant match of the frame of the chalkboard with the dark wooden cabinet underneath. One of the highlights of this coffee bar is the featured section of coffee beans in glass bottles. Add some ambient illumination and plants, and you’ve got your hands on a relaxing and elegant design.